Taking inspiration from RingCentral’s research report on application overload, “From Workplace Chaos to Zen”, I met with John Batty, Director of Professional Services and Solutions Engineering, to discuss some of the headline areas that the report highlights. App overload – How did we get here? I asked John how we got to this state of workplace chaos and what sort of apps are leading to the overwhelming volume of communications. John said his team was best placed to cover this. “When we go in and see a customer, the first thing we see is what they are currently using. We see them at the worst and ready to make a change for the better. One of the pieces of feedback that we get often is the greatest detractor is how many apps they must navigate daily. People are getting tired of having to use multiple apps for HR, for sales, for CRM, etc. According to our research, seventy percent of workers say their communications volume is a challenge to getting their work done. In many ways, they are speaking to RingCentral because we are an organisation that can consolidate their various apps and communications into one. We’ve found that enterprises who are taking a best of breed approach to apps, are sometimes asking their staff to use 15-20 apps at any one time, which presents different problems but especially dissatisfaction in the workforce. Specifically, more than two-thirds of workers say they waste up to 60 minutes navigating between apps, and 68% of workers toggle between apps up to 10 times an hour. John indicated that it’s a big change for any business to discontinue or migrate from their current tools. How do we get away from the chaos? Recognising that there are too many apps and that maybe some businesses are too attached to drop them, I wanted to get John’s opinion on how we get away from this mentality that we need an app for everything. “We help customers with this on a regular basis. Where RingCentral win is by demonstrating that we can bring calling, meeting, and messaging together in a single, easy to use unified application. What’s more, our solution limits the risk of going through technological consolidation by integrating out-of-the-box with hundreds of popular leading apps like Salesforce, Google, Okta, and more. For enterprises that want even more customisation, we offer open APIs. The best way to ease worker’s frustration is a unified application to consolidate their communications. In fact, our research indicates that 67% of workers believe a unified platform would help them achieve a better workflow, 65% believe it will help them be more productive and 62% believe a unified platform would help work feel less chaotic. Making a tangible case for Unified Comms and Collaboration has been a real challenge for the entire industry for a long time. I asked John what conversations he was having with RingCentral customers to quantify this. “This conversation has gotten significantly easier. With Gartner stating that by 2021 90% of IT leaders will not purchase new premises-based UC infrastructure since future cloud UC offerings will be far ahead in terms of features, functions, portals, analytics and dashboards, everyone is planning their move to the cloud. The conversations we are having revolve around how moving to the cloud will make it easier to provide a happy working environment. This comes in the shape of supporting flexible working, remote working, more collaboration and less apps. If we can create a better working environment, and one that makes communicating easy, we can combat attrition. By making it easier to work in these organisations, employees are more likely to sing the praises of the company, you can be saving money by retaining and attracting staff. In the world of customer experience there has been a buzz recently over reducing the customer effort when it comes to contacting a business. Disjointed communications technologies, which affect employee productivity and ultimately hinder their ability to effectively service customers, need to be addressed internally in order to have an external effect. By fixing the employee experience, organisations can ultimately improve the customer experience”. What happens when it comes down to more than money? I gave John an example of a procurement I ran where the customer decided to stay with their existing provider as the deemed overall costs were lower. I asked him how RingCentral react to this scenario. “What we are now seeing is that customers are asking outright how can you add value to our business? We can confidently stand behind the answer of selling value. 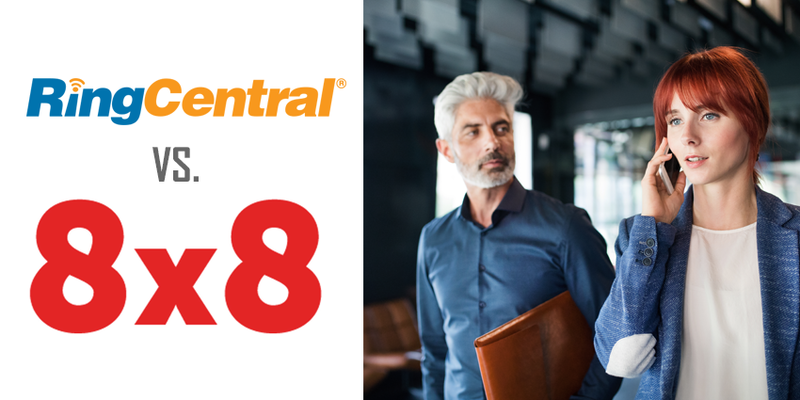 From a cost point of view, we could be higher but can present the value of the productivity and business benefits you will gain through RingCentral. And the market today is sensitive to that”. John also reference the Gartner Magic Quadrant where the leaders aren’t necessarily the cheapest. The market has changed. How is the C-suite holding back collaboration? One stand out point for me in RingCentral’s “From Workplace Chaos to Zen” report was that C-level is holding back collaboration in the workforce. I asked John for his thoughts on how a typical worker bee can drive change in an organisation. Considering that the C-suite is already bombarded with emails and messages with 80% of executives finding their communications volume challenging, it’s no surprise that 27% find team messaging disruptive. However, this is likely due to the many disparate and disjointed communications floating around – one unified platform would help address this problem and is exactly what worker bees are calling for. One of the biggest factors in driving change in an organisation is culture. By establishing the need for a change, understanding what your needs and requirements are, and ensuring everyone agrees and onboard with the changes organisations can make the transition to unified communications seamless. It is important that everyone understands the technology and is willing to adopt it and use it to truly make a difference. Everything I spoke to John about relates to the real world. These are everyday experiences that businesses go through. And it shouldn’t be the case anymore. It’s refreshing to see someone like RingCentral viewing the workforce challenges from the genuine workforce. For more information on migrating to the cloud (without getting overloaded) you can find the full RingCentral report. ‘more than two-thirds of workers say they waste up to 60 minutes navigating between apps’ It’s not clear over what period this is being measured – Day/Week/Month? Liked the article; Improving employee experience improves customer experience is so true.